Welcome to Rimfire World – Back in 2008-2009 I started a website called Tactical22.net. It was based initially on gathering and sharing information on AR15 .22 rifles that utilized the various conversion units that were available over the years. 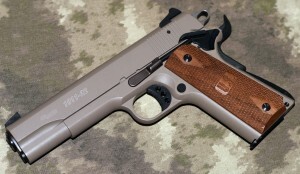 Eventually the site began to morph to include 1911 conversions and then finally anything and everything .22 rimfire. In the middle of that a forum with a small group of dedicated followers was also born. We saw our peak when the likes of Colt, Smith & Wesson, Heckler Koch negated the need for conversion units and released dedicated .22’s that looked felt and handled somewhat like their centerfire counterparts. Those were exciting times for .22 rimfire fans. Today in 2016 it’s hard for a guy with a website and forum to keep attracting new website visitors and members for the forum. I decided it was time for a rebirth of sorts. Time to carve out our own niche with a new website design and forum whose design lends itself to remaining true to the original format while integrating closely with social media. The other big change is the format will allow for more interaction and content from guests, visitors and industry friends. The old site will remain active as long as it still gets visitors. It’s also my plan to move over the most interesting and original content. If you like what you see please join the forum or drop us a line and ask how you can help. Sturm, Ruger and Co. challenged in Federal court a Texas company that sells exclusively aftermarket components for the Ruger 10/22 rifle, claiming the company hijacked its name and ubiquitous design. The complaint accused Kidd Innovative Design of trademark infringement, unfair competition and deceptive trade practices. However, shortly after it was filed last week in Ruger’s home state of New Hampshire, Kidd said it began focusing efforts to comply with Ruger’s requests, Mary Kidd, a Kidd company spokeswoman, told Guns.com. As stated in the complaint, Ruger is primarily asking Kidd to stop using its name, turn over all products and materials using its trademarked names for destruction, and pay for corrective advertising and court and attorney fees. Since its introduction in 1964, the 10/22 has developed a large aftermarket for components like barrels, triggers, receivers, stocks, etc. fitted for the design and allowing for customization in a variety of ways — one reason, hobbyists argue, it’s so popular. Ruger claimed Kidd included “Ruger” and “10/22,” both registered trademarks, in the marketing of its products, suggesting to consumers that Ruger sponsored, approved or jointly designed the items, according to the complaint. However, upon review of Kidd’s website, no direct references to “Ruger” or “10/22″ could be found in its product titles. Kidd has been registered as an active business in the state of Texas since 2000 and operates through its website and third-party sales sites. Ruger, on the other hand, was founded in 1948 and its current market cap is north of $900 million, making it one of the largest — if not the largest — gun makers in the civilian market.